Get 40% off new full-price styles and an extra 40% off sale styles at Ann Taylor. Valid in stores and online. Use code HURRY40 or use code SAVE40 for free shipping on full-price orders of $125+. Sale ends tonight at 3AM EST. These Carson tassel suede pumps are going fast in the soft dove color. I thought I could place my order tonight before I wrote this post but my size is all sold out. Sadly I will have to internet stalk these or hope that they appear in stores soon so that I can try them on. Sara snapped them up during the last sale and she said they fit in her usual size. You can see them in the soft dove color in her lovely lay downs here and here. Also, the following are some overdue reviews of my haul from the last Ann Taylor sale which was actually better savings (refer to this post here). 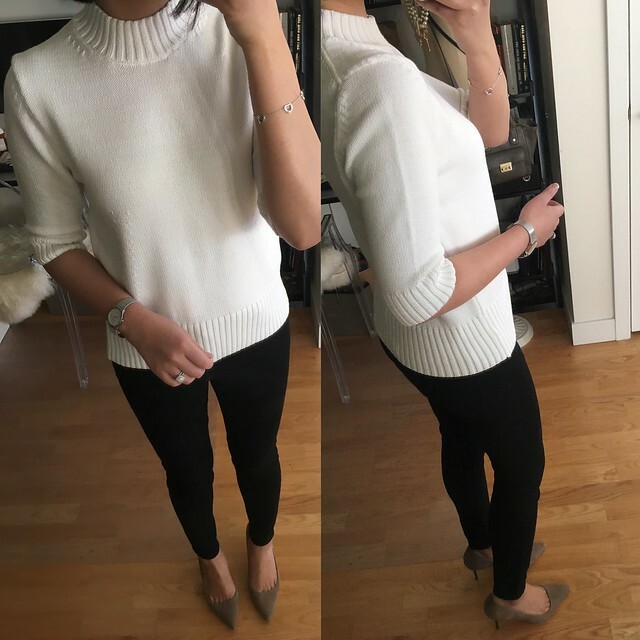 I ordered size M for this Ann Taylor mock neck sweater after trying on size L (review here) in stores and it fits me perfectly. I didn’t want a cropped sweater so I went with the regular missy sizing for the extra length in the body and sleeves. I’d say this sweater runs small and fitted so go up at least one size. 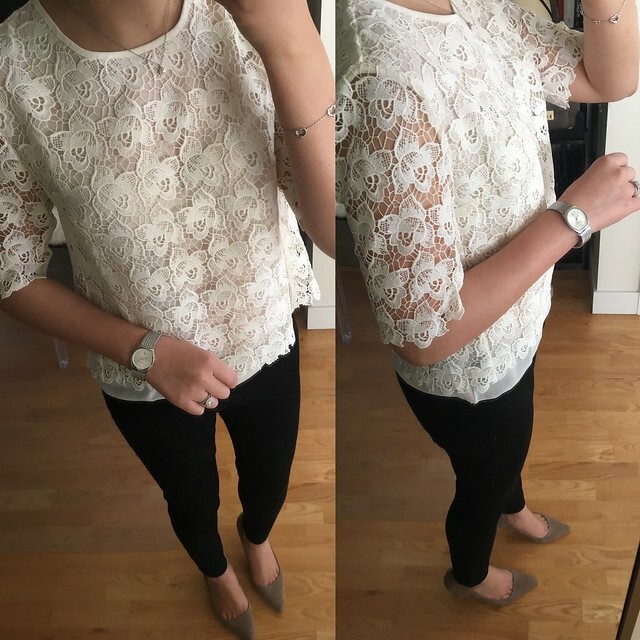 This floral cute lace tee is another item I was able to try on in store in XSP (review here) which helped with my decision to order size XXS regular online for some added overall length. As I mentioned before, this top is slightly sheer but you can’t really make out the outline of my bra so it doesn’t really bother me. Return update: I ended up returning this top since I noticed the lace was a bit itchy for me even though it’s lined. 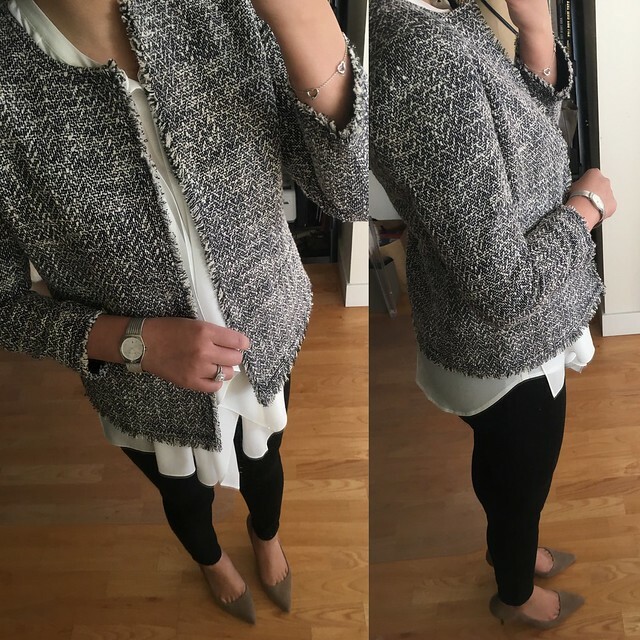 I’ve been wanting this belted tweed jacket for some time now but petite sizes sold out very quickly. Size 0P popped back in stock during the last sale so I quickly checked out to secure this jacket. Unfortunately, it didn’t fit me exactly as I hoped and wearing it belted didn’t look good on me because of the boxy fit. I also tried to wear it unbuttoned and without the belt but the side profile of the jacket looked very wide on me so I had to return it much to my dismay. It’s a gorgeous and well made jacket if it fits. 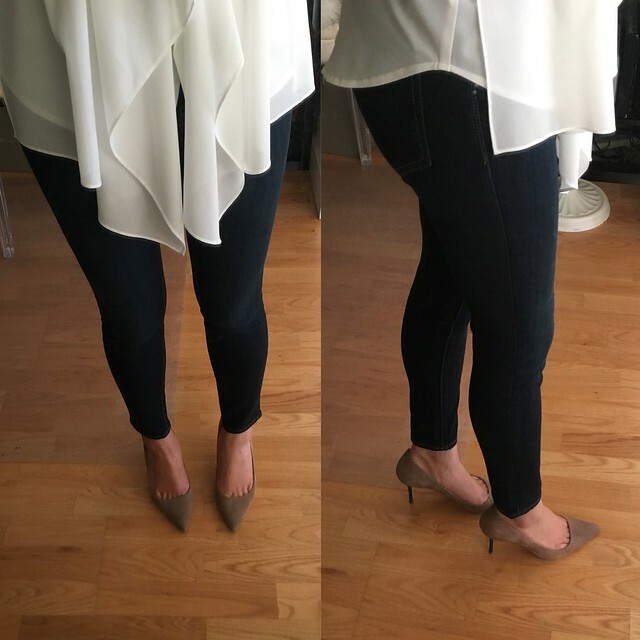 I loved these modern super skinny ankle jeans in the deco wash (review here, last seen here) so I decided to take the plunge and order both the carnival wash and the white version (below). I have worn and washed the deco wash and they keep their shape really well after a full day of wearing them. The carnival wash is the same in terms of how well it retains it’s shape but the leg opening (9.5″) at the ankles isn’t as narrow as the deco wash (9″) despite the fact that they’re both the same style (modern super skinny ankle jeans). I’ve worn the carnival wash twice but I haven’t washed it yet but I hope it will continue to hold up. Note that the deco wash is more of a mid wash with some texture/grain to it while the carnival wash is a nice dark wash that doesn’t have any color transfer issues on my hands or other articles of clothing.